The King of Cups in a Tarot reading is someone who will be friendly and of service to you, sensitive, fair and honest which may cause you to open up your feelings to new experiences, but beware of he does not abuse his position or only pretends to help when he really means ill will. In the reversed position is more likely which is indicative of a double dealing cold hearted con man causing you serious loss in love and life leaving you bitterly disappointed. 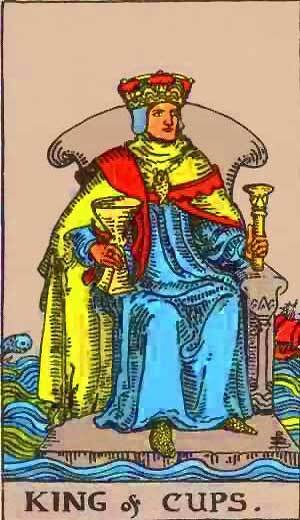 King of Cups – A fair Man, Goodness, Kindness, Liberality, Generosity. The YOD in the vesica refers to the attribution of all Kings to the Sephirah of Wisdom, and to the letter Yod. He represents the positive aspects of desire-force in the mental realm. From beginning of last decanate of Gemini to end of second decanate of Cancer, June 20th to July 10th, combining the rulerships of Saturn-Uranus, the Moon, and Mars. Subtle and secretive; crafty, psychic, artistic; strong, violent desires, but calm exterior. Friendly to the Querant, and really wise. Evil and merciless, and likely to be attracted by occult studies promising power and wisdom for the satisfaction of desire without purification of character. More information on the King of Cups Tarot card. This entry was posted in Tarot, Runes and Divination and tagged desires, feelings, king of cups, love, occult, psychic, science, tarot, the moon, wisdom. Bookmark the permalink.